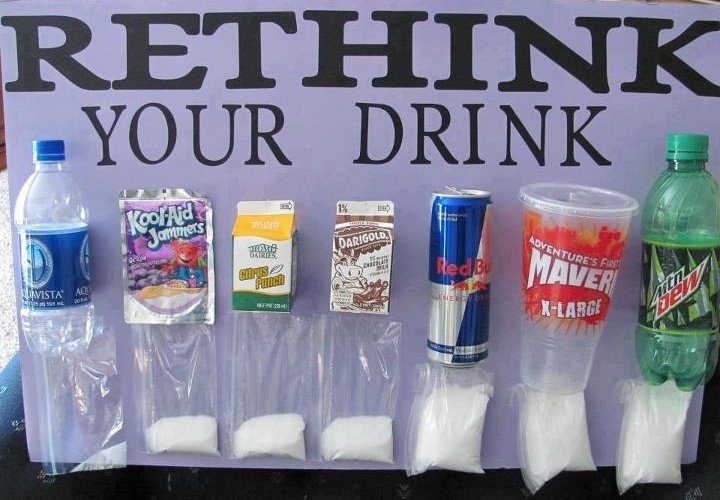 Rethink what you drink!! Excessive amount of Sugar in your Drinks | FITAPPY Fitness & Healthy Plan to Change your Life! ← July Workout Challenge ♦ Beat Your Personal Best each time! Have you even wonder how much sugar contains your favorite drink? In case you’ve been dieting and exercising without successful results, perhaps you should ask yourself if sugary drinks are part of your diet 😉 Just to let you know, a single can of coke has 39g of sugar. In addition, check the number of serving per container because one bottle of soda or energy drink can have more than one serving. Anyway, I think the picture is very visual…. This entry was posted in Diet and tagged Dew, healthy drink, juice, Kool Aid, Mountain, Red bull, sugar, sweet, water. Bookmark the permalink.